I don’t want to let the state of the economy get me down. So I do my best to scoff at it. But what begins with haughty laughter at the latest reports of financial doom usually ends with me crying into a bowl of generic-brand, Honey Nut Happy-O’s from CostCo. Norweigan John Kristiansen apparently feels no such pain. Or he’s inhaled a few too many fiberglass particles for his own good. 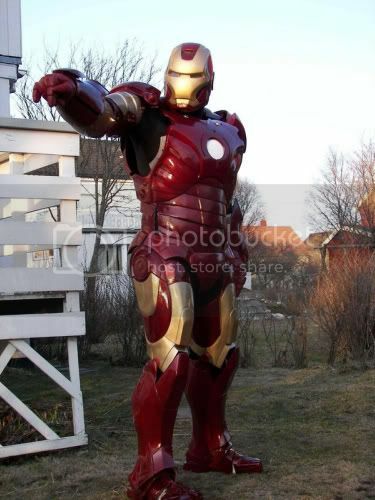 As described in this article from Popular Mechanics, John and his buddies in “TMP” set a goal to build a homemade replica of the armor from the Iron Man movie and complete the project before the flick hit theaters last summer. And $20,000 later, they discovered that gobs of money can, in fact, make dreams come true. Oh, and a little bit of talent for molding ABS plastic and fiberglass probably helped. But, whatever. Money is where it’s at, people. Cha-ching! Is Norway where money comes from or something? That would explain a lot, including why I’ve been having a hard time getting ahold of some. Actually, Norway does have the highest standard of living in the world, and one of the highest GNP per capita. Maybe he got more that $20,000 to tour with his Iron Man armor. Or maybe he has decided to ignore the Recession and not participate in it. @Jim: Yeah, I’m getting pretty bored with this whole recession thing. You can count me out, too. Hey, Matt, nope. The article from my friend Pete at /Film says that *one component* of the costume cost $1,500 – $2,000. Hey guys…just a little FYI.